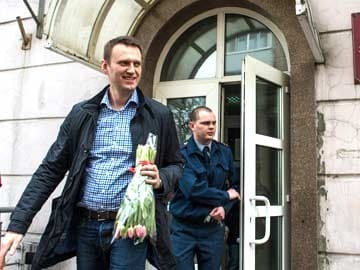 Russian opposition leader Alexei Navalny leaves a court building after a hearing in his Yves Rocher's case in Moscow, on March 7, 2014. Moscow: Russia has blocked three major opposition news websites as well as the popular blog of Kremlin critic Alexei Navalny, the latest in a media crackdown that comes amid Moscow's standoff with the West over Ukraine. The government's media watchdog Roskomnadzor said late on Thursday that it was adding three popular opposition news websites including Grani.ru and EJ.ru to its banned list, along with Navalny's Live Journal blog. The move comes days after the chief editor of one of Russia's oldest and most popular news websites, Lenta.ru, was summarily dismissed over the coverage of the Ukrainian crisis. The sacking of the veteran editor triggered an exodus of journalists from the media outlet. The Russian-language Internet is almost the only outlet for opposition political views, with state television and popular newspapers backing President Vladimir Putin's policies. Roskomnadzor said the media outlets, which also include a website founded by chess champion turned activist Garry Kasparov, were banned for "calling for unlawful activity and taking part in mass events held with breaches of public order," apparently referring to rallies. Russian Internet providers were on Friday blocking access to the websites, which could still be accessed on Internet providers outside Russia. Tips on how to get around the ban were circulating on social media. Navalny's blog, which is fiercely opinionated and critical of Putin, is one of the most read on the Russian-language Internet. It was blocked because he has been placed under house arrest last month and is not allowed to use the Internet, Roskomnadzor said. Navalny's blog was updated several times after his house arrest began. One entry said that Navalny had got round a ban on giving interviews or using the Internet by asking himself questions and writing the answers by hand. Confined to his apartment in Moscow, Navalny is banned from using the Internet, receiving post, giving media interviews or talking to anyone except his lawyers or close family.